The New Day faces The Bar to determine no. 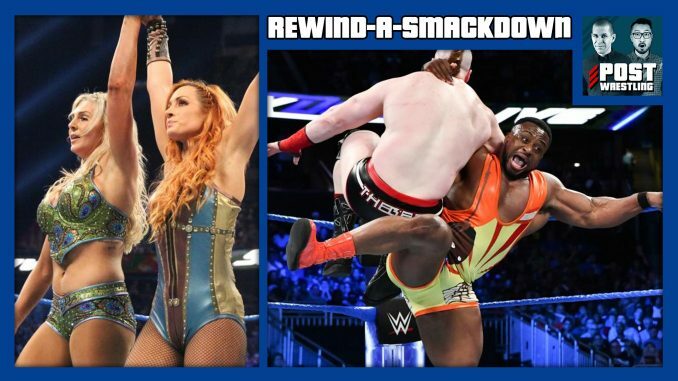 1 contenders for the SD Tag Team titles, Becky and Charlotte team up, AJ Styles responds to Samoa Joe, and Daniel Bryan visits the set of Miz & Mrs.
We discuss top stories from POLLOCK’S NEWS UPDATE including Raw ratings following Ronda Rousey’s first televised match, Total Bellas being renewed for Season 4, the Mae Young Classic announce team, and New Japan being unhappy with Tama Tonga. John catches us up on Season 4 of Lucha Underground with a review of last week’s show and the ongoing battle between the Worldwide Underground and the Reptile Tribe. Plus, not one but TWO beheadings on the same episode.